Because you - yes, you! - demanded it: Marvel's all-star cosmic team - and cult faves Rocket Raccoon and Groot - in one massive story! The Silver Surfer! Beta-Ray Bill! Gladiator! Quasar! Ronan! 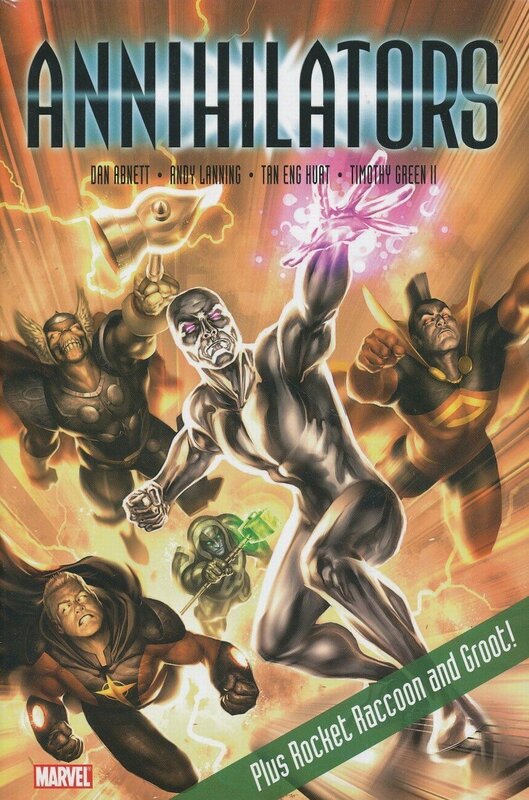 When the Dire Wraiths strike, Cosmic Masters DnA (THE THANOS IMPERATIVE, THOR/IRON MAN) and Tan Eng Huat (SILVER SURFER, THOR: FIRST THUNDER) assemble the heaviest hitters in all the universe to save the day! And not to be outdone, the demented duo of Rocket Raccoon and Groot return for their own, reader-friendly adventure! What do you do after you've saved the galaxy? DnA and the fabulous Timothy Green II (ANNIHILATION: CONQUEST - STAR-LORD) answer that question with madcap sci-fi combat and swashbuckling, space-faring mayhem! Collecting ANNIHILATORS #1-4.